Soft wash kills algae, mold, and mildew instead of just blasting it off, keeping the surface clean and clear of discoloration longer. So What is Soft Washing? Soft washing is the use of a combination of biodegradable chemicals and a low-pressure, non-abrasive water jet to kill harmful and unsightly algae, mold, and lichen, while cleaning off hard to remove dirt and discoloration. The low pressure water jet is unofficially described as any jet that you could safely put your hand in front of, whereas the high pressure jet will cause laceration and damage to uncovered skin. Why is Power Washing Not Preferred in Most Cases? 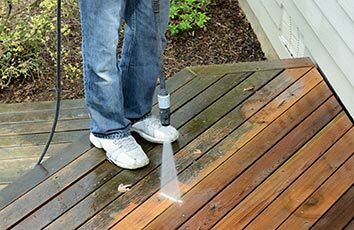 High pressure power washing can cause permanent damage to all surfaces commonly found on and around your home. 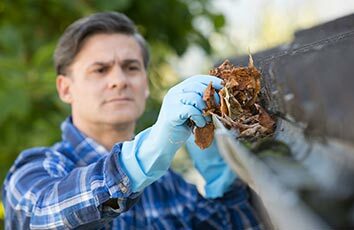 Not only can a high pressure jet damage and discolor vinyl siding, it can also shoot water underneath the siding, causing leaking and unseen damage. With wood, a high pressure jet can strip finishes, etch the soft pulp of the wood, and damage the lignin that holds the pulp together, and gives the boards their structural integrity. The high pressure jet can permanently discolor concrete, stone, and brick, and it can loosen and erode the mortar between bricks and stone. Aesthetically speaking, the high pressure jet mechanically removes the algae, mold, lichen and mildew from surfaces, making it look clean. That plant life typically grows back quickly however, because it was not chemically treated and killed at the source. Why Don’t More People Use Soft Wash? 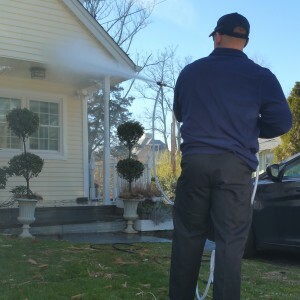 The DIY homeowner is more likely to purchase a relatively inexpensive pressure washer from a box store than to invest the several thousand dollars it costs for a commercial grade soft wash system. Regrettably, the same can be said for many “professionals” who market their power washing services. Just because the equipment is more expensive, it doesn’t mean the cost for the service is necessarily higher. Our soft washing prices are generally competitive with our competitor’s power washing prices. And, considering that soft washing both removes and kills the source of the unsightly stains, your home and exterior surfaces will stay clean longer, representing a better long term value. 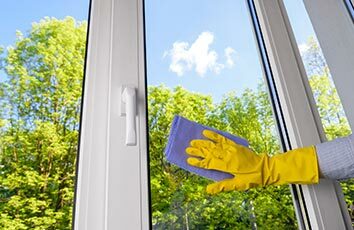 Are Hard Water Stains Ruining Your Windows?